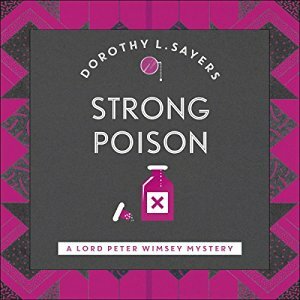 I was not enamoured of my first foray into the world of Lord Peter Wimsey a few months back but didn’t want to eschew one of the genre’s best known classic authors on the basis of a single read so when 1930 was chosen for this month’s Crimes of the Century I dove into STRONG POISON. I think I can say now with some certainty that Sayers…or at least Wimsey…is never going to become a firm favourite for me. Some of this is undoubtedly due to confirmation bias. I am the granddaughter of somewhat militant Irish immigrants and both my parents were at one time shop stewards for their respective unions. On what I have seen to date Lord Peter Wimsey embodies everything I innately find…irksome about the aristocracy (that’s much softer language than my family would use). He’s even more annoying than Downton Abbey‘s Lady Mary. But there’s also the fact that he displays the preposterous brilliance in all avenues of human endeavour that is popular among fictional sleuths and his preponderance for making up words (someone calls it piffling in the book). I know some people find this delightful and I wish I did (as happened whenever Douglas Adams engaged in the same practice) but somehow it all combines to make him tiresome to me. Even his Achilles’ heel, only hinted at during the text proper but revealed in an end note to be shell shock brought on by his war service, has a kind of self-serving ring to it. Like a job candidate who answers “unbridled perfectionism” when asked what their weakness is. Putting aside for a moment my disdain for the ‘wealthy chap with the luxury of choosing how he spends his time and money’ character I did actually enjoy the read much more than my earlier foray into the series. STRONG POISON opens with a Judge providing his instructions to the jury in the murder trial of a woman writer called Harriet Vane. She is accused of poisoning Phillip Boyes, a man she had lived with until a year or so before his death. At first I thought this an odd and potentially dull way to start a story but actually it works well. Not only does it provide a good summary of how things stand – bringing the reader immediately into the heart of the story – but gives a clear sense of how dire things are for Harriet Vane. It looks impossible that she will avoid the hangman’s noose and the reader can’t help but want to know how the seemingly impenetrable case will be turned on its head (as we all know it is sure to be). Which is where our master sleuth enters the fray. For reasons that I don’t think are ever provided (or if so I missed them) Wimsey has been watching the trial. He is convinced of Vane’s innocence and reveals, when he wrangles a visit to the prisoner, that he has also fallen for her. As far as this goes he is rebuffed fairly stiffly, being the 47th person to propose marriage since Vane has been accused of the murder, but he does not let that dissuade him from his quest to prove her innocence. With the aid of his butler, a sympathetic police inspector of his acquaintance and his own typing agency of women who can turn their hand to many things, the impossible task is tackled with vigour and creativity. What follows is a little uneven. For example we spend, for my liking, way too much time learning how one of Wimsey’s agency women inveigles her way into a key player’s life by pretending to speak to (or for?) the dead, but for the most part the story is engaging in the way it picks apart each of the pillars of the prosecution’s case. Sayers has managed to make this suspenseful even though no one can be in any doubt that Vane isn’t going to die at the end of it all and that is not an accomplishment to be sneezed at. There is also a strong sense of Sayers’ undoubted feminist streak. I’m not convinced that Wimsey is really as enlightened as we are presumably meant to believe. When he proposes marriage for example he does so on the basis that Harriet would be different from the “ordinary kind [of wife] that is only keen on clothes and people“. But the women of this story make their presence felt despite Wimsey’s near-omnipotence. Although she hardly appears Harriet herself is a strong character – not only making her way in the world without the aid of a man – but failing to succumb to Wimsey’s charms. I was quite pleased that this thread did not resolve in the way that might have been expected and not only due to my dislike of Wimsey. English actress Jane McDowell read this story to me very entertainingly and I must admit I am tempted to let her read me the next instalment of the Wimsey/Vane storyline even though I don’t particularly like the man himself. There is much delight in hearing great dialogue spoken properly and Sayers does have some terrific passages here (mostly the ones without the made up words). So perhaps I it turns out I can enjoy a book even if I don’t like its main character. This entry was posted in blog spotlight, Dorothy L. Sayers, England. Bookmark the permalink. Oh, sympathies, Bernadette! I’ve just been undergoing my first (and I’d say last) experience of Philo Vance, who’s like early Wimsey but a whole lot worse — with added snobbery, added pretension, added measures of that backpfeifengesicht quality. Sayers’s use of nonce words is one aspect of her writing that has never troubled me. (“Piffling” is a real word, though — as in “a piffling concern.”) Maybe because I use them a lot myself . . .
Glad you enjoyed this story even if you didn’t like Wimsey. Have his Carcase features Harriet a lot more and I also think it has a stronger puzzle. If you don’t like Wimsey but like Sayers’ as a writer you could read her book Documents in the Case – one of her few non-Wimsey productions. I really enjoyed and likes the use of different types of texts to communicate the events of the story. I didn’t mind them back in the day but a recent attempt to reread, brought me to a halt. So mannered and unlikable. This is one I would like to reread soon. I have experienced difficulties with rereading Sayers books, and I was a big fan previously. I want to reread this one and then watch the TV adaptation (which I watched a long time ago).